Gatimaan Express, which has been declared as India’s fastest train with speed of 160+ km/hr is now ready to be launched. Test runs of this train have been successful, as it covered 195 kms within 115 minutes between New Delhi and Agra Cannt. railway stations. As per reports coming in, PM Modi will inaugurate first commercial run of this train somewhere between 2nd and 3rd week of June. As of now, there has been two test runs of this train, and both were successful. Initially, this train will run between India’s two biggest tourist destinations: Delhi and Agra. Later, several more routes can be included for India’s first semi-high speed train. – On June 2nd, during the 2nd trial run of the train, it departed New Delhi’s Paharganj Railway station at 11.15 AM and arrived at Agra Cannt. railway station at 1.10 PM. There was a delay of 10 minutes. – To attain highest speed of 160+ km/hr, Railways have fenced off the tracks at some sections, and signaling mechanism have been upgraded. 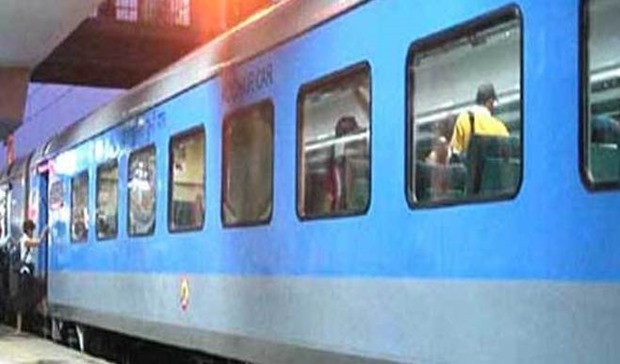 – One way fare for AC Chain Car (CC) category has been finalized at Rs 690, which is 25% more than the fare of Shatabdi Express in the same route. Rs 1365 would be the fare for Executive Class. – As per the initial plan, the train will start from New Delhi at 8 AM and reach Agra by 9.45 AM, thereby covering a distance of 195 kms in 115 minutes. From Agra, the train will start at 5.30 PM and reach Delhi at 7.15 PM. – The train is equipped with additional security features such as automatic fire alarm, emergency breaking system, sliding doors and advanced passenger information system. – The coaches for this train have been designed specially at the Rail Coach Factory in Kapurthala in consultation with RDSO (Research Development and Standard Organisation). Each coach will cost around Rs 2.5 crore. Besides 12 regular coaches, there would be 2 spare coaches as well. – 8 inch LCD will be provided behind every seat of this train. Initially, these will showcase pre-programmed content, like in-flight entertainment system. Later on, provision of live-feed would be implemented, powered by satellite television and content distribution. As per various reports, after Delhi-Agra corridor, Gatimaan Express will soon be launched in these routes: Chandigarh-New Delhi; Kanpur-New Delhi; Hyderabad-Chennai; Goa-Mumbai; Nagpur-Bilaspur and Nagpur-Secunderabad. "India’s Fastest Train: Gatimaan Express To Cover 195 kms in 114 mins; Speeds Top 160+kmph/hr", 5 out of 5 based on 1 ratings. Its great news for every Indian. I would request the department and officials to extend this facility to high passenger route in next phase like Delhi to Patna, Delhi to Kolkata, Delhi to Guwahati etc. and second thing please ensure safety and facility of passenger en-route. What is the source of the image with the LCD screen? By putting a wrong image (actual source: http://www.volo.tv/more/), you are creating a wrong impression in people’s mind that actual interiors of Gatimaan express would look like this. Be responsible. Thanks for pointing it out to us. We always give source credit for the images that we have used from elsewhere. In this case, it somehow was missed, and it was also wrongly put. We apologize for that. We will remove the image and thanks for pointing it out to us. “We always give source credit for the images that we have used from elsewhere” That’s is absolutely FALSE. The indian press is NOTORIOUSLY known for using images of modern expressways and trains and buildings and architecture and bridges and A LOT OF OTHER THINGS from Japan and China and Europe and giving the impression that those images are of india. There are countless videos put out by indians that show images of Tokyo and Shanghai and Singapore or other cities that are clearly used to give the impression that the images are of some indian city, USUALLY mumbai. In FACT, it is so highly practiced by the indian press that even indian commenters are complaining about it as it IS an embarrassment that the indian press is constantly using such LIES that are SO BLATANT. 195 kilometers in 114 minutes comes out to an average of about 100km/h. That’s not exactly “melting the tracks” kind of speed. Indian tracks are known to melt in summers, anyway…so, it does not take a lot to melt them. Good and uniqe initiative+effort+outcome of NDA Govt. Rail Minister now shud shift double deckor Delhi_ Agra to Delhi Lucknow route either it shud be extended upto Gonda which transport huge traffic in all the seasons. Delhi -Gonda Route be alloted More Trains having more seating capacity ensuring maximum travel time of 8 hrs initially. Another abandoned route is Gonda-Behraich-Pilibhit-Mailani-Moradabad-Delhi which must be taken care on urgency basis because a huge population of northern Uttar Pradesh and Nepal travel by bus which consumes more than 24 hours to reach at destination. Dudhva National Park is undermined due to lack of transport (Railway). Kheri-Lakhimpur-Gola-Mailani- Pilibhit, Palia, Tikonia, Sisaiya, Katariniaghat- Nighasan- Nanpara-Behraich-Nepalgang like important tourist spots are abandoned. Good initiative tho!! India should raise standards to the level of China & other countries where people depend on the rail network. Develop and make new tracks with speeds touching atleast upto 200 kmph which is the need of the hour. India has the biggest rail network in the world and yet with so less facilities. Railways should increase facilities and make it par with airlines so that those who prefer airlines also feel comfortable travelling by rail. There are people who can afford higher fares also. Business sectors such as Delhi – Mumbai should be made more faster and convenient for people to commute with the introduction of new high class trains and services. If train leaves Delhi at 8 am and takes 115 mins, it’ll reach Agra at 9.55 am and not 9.45 am. Or if its reaching at 9.45 am, then it takes 105 mins, not 115 mins. a big congrats to the indian railways .